Phil Hartman provides the voice of monorail con man Lyle Lanley, and though this character never reappears nor rises to the ranks of Lionel Hutz and Troy McClure, Hartman unsurprisingly does a great job with the part. The producers originally wanted Leonard Nimoy to appear as the Grand Marshall for the monorail's maiden voyage, but they assumed he wouldn't be interested. Instead, they asked George Takei, and when he ultimately declined, they asked Nimoy, who agreed after all. A washed-up Lurleen Lumpkin, from "Colonel Homer", is one of the celebrities in attendance for the monorail grand opening. Marge: I still think we ought to spend the money to fix Main Street. Homer: Well, you should've written a song like that guy. Homer: Do you want to change your name to Homer Junior? The kids can call you Ho-Ju! Bart: ...I'll get back to you. Marge: According to this book, the monorail goes over 150 miles an hour! What if something goes wrong? Homer: "'What if.'" What if I stepped in the shower and slipped on a bar of soap? ... Oh, my God! I'd get killed! Marge: There's a man here who says he can help you. Like "Mr. Plow", this is another indisputable classic, routinely cited by fans, creators and critics alike as one of the show's all time best episodes. Though Homer is named conductor of the monorail (because this is a show about the Simpsons after all) and Marge is the driving force of the plot, this episode is really one of the first Simpsons episodes that's about the town of Springfield itself. 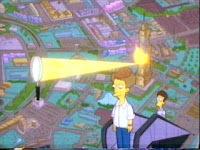 Though previous episodes have given the spotlight to supporting characters like Principal Skinner or Otto, this is the first time we really start to get a sense of the town as a home to all these screwball characters, and how the collective consciousness of those characters lends itself to the character of the town itself, a place that would build an escalator to nowhere. It also features one of the show's best musical numbers, a Music Man-inspired pitch for the monorail that includes the line, "sorry mom, the mob has spoken!". But what really makes this episode a classic is that it is simply crammed full of jokes from end to end. Barely a minute goes by without something hilarious occurring, whether it's a throwaway visual gag or a more layered piece of satire, and all of the jokes are woven seamlessly into the plot. In that regard, it is one of the most well constructed and well executed episodes in Simpsons history. It's "Marge vs. the Monorail". 'Nuff said. Homer: Donuts...is there anything they can't do? Mayor Quimby: Yes, and may I say, "May the Force be with you." Mayor Quimby: I think I do. Aren't you one of the Little Rascals? 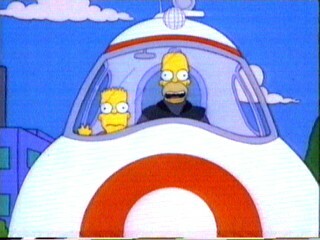 Homer: Simpson, Homer Simpson. He's the greatest guy in history. From the town of Springfield, he's about to hit a chestnut tree. AAH! I also always liked the visual gag of the toothpick skyscraper getting burned down by the giant magnifying glass. It is a classic episode. As you said, it's Marge vs The Monorail, 'nuff said. However, the opossums always freaked me out. 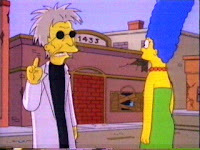 @Dr. Bitz: As you said, it's Marge vs The Monorail, 'nuff said. I edited that in there just for you. I love that opening revision of the Flintstones song. As well as the irradiated squirrel with laser eyes. Fun fact: As a kid, I always heard the name as "Heidi" and thus wasn't sure what the joke was. 2nd Fun Fact: I was a pretty stupid kid. I've heard that, that they can almost be domesticated in some cases. This is one of the half-dozen Simpsons episodes I've seen, and I do remember enjoying it — which probably sounds like a completely underwhelming response to a Simpsonista, I realize. A little constructive criticism, Mr. T: You should include the initial air date of the episode under (retro) review. I love the phrase "Notable Notes". Is that actually from the show or does it just sound Simpsonian? @Michael: I'm sorry, "one of?" Haha! Off the top of my head, I might put "Flaming Moes" or the Stonecutters Song ahead of it, but I certainly wouldn't begrudge anyone making an argument for the Monorail song being #1. It's certainly worthy. 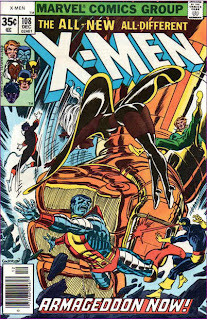 @Blam: I do remember enjoying it — which probably sounds like a completely underwhelming response to a Simpsonista, I realize. Nah, the fact that you remember enjoying it, considering that I know you haven't watched much Simpsons, I consider a testament to its quality. You should include the initial air date of the episode under (retro) review. As far as I know, it's a bit of Simpsons-speak I made up (though I wouldn't be surprised if it is used in an episode somewhere and entered my subconscious). It's an amalgamation of the "potent potables" category that was always listed in the SNL "Celebrity Jeopardy" sketches and a line from the Simpsons episode "Mr. Lisa Goes to Washington", in which Homer becomes obsessed with Reader's Digest, and one point quotes a passage from a section called "quotable notables". At least, those are the two things I always think of when I type out "notable notes". @Teebore Haha! Off the top of my head, I might put "Flaming Moes" or the Stonecutters Song ahead of it, but I certainly wouldn't begrudge anyone making an argument for the Monorail song being #1. It's certainly worthy. Ah. "Stonecutters" had temporarily slipped my mind. Still, I'd have to put it at a close number two. I'd read that. Then again, I read most everything here... But still, do it! @Michael: Ah. "Stonecutters" had temporarily slipped my mind. Still, I'd have to put it at a close number two. Though it's been a while since it's popped up, my friends and I used to make frequent use of the phrase, "Batman's a scientist." Also, I have a good friend who's way into MMO's, and in pretty much every game he's ever played, he's made a character named "Hoju". @Matt: Also, I have a good friend who's way into MMO's, and in pretty much every game he's ever played, he's made a character named "Hoju". As someone whose internet moniker is similarly derived from a bit of random Simpsonsonia, I wholeheartedly endorse that action.